After graduating in visual arts education in Kassel, she continued her studies in the Netherlands. She studied psychology at Nijmegen University and completed a visual arts study at the Amersfoort ‘Academie voor beeldende kunsten’[ School of Visual Arts ]. 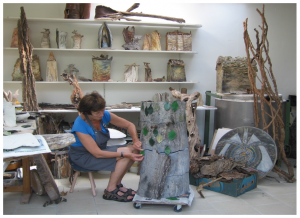 Her source of inspiration is matter in all its manifestations, such as pieces of wood, bark, iron etc. Take a piece of bark, for instance, and it is made the basis of a three-dimensional, ceramic sculpture. The ceramic forms take over the colour, texture and structure of this piece of bark. The rendition of the glaze texture resembles the structure of the wood so closely that wood and ceramic are barely distinguishable. 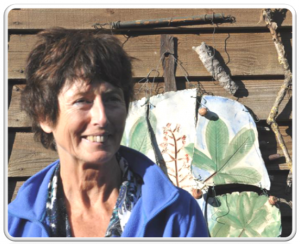 Barbara describes the principle on which her art is based in the following way: ‘matter, to me, always carries life; it changes from one state into another, it is tangible and mysterious at the same time. Matter represents a world that is concealed behind the material form. To me man, matter and nature appear in unity and I try to evoke this aspect in my work.